The rotator cuff is a group of 4 muscles in the shoulder and upper arm. The muscles help to move the arm at the shoulder and to stabilize the joint. The muscles are connected to the shoulder bone by tendons, which are strong, flexible cords. The muscles or tendons may become damaged from long term overuse or from injury. Do not eat or drink anything after midnight the day before your procedure, unless told otherwise by your doctor. General anesthesia is typically used. You will be asleep during the procedure. A cut will be made in the skin over the shoulder. The torn muscle or tendon will be repaired and reattached and/or anchored with stitches. The incision will then be closed with stitches or staples. A few small incisions will be made in the shoulder. A narrow tool called an arthroscope will be inserted through the incision. The scope has a tiny camera to allow the doctor to see inside. Other small instruments will be inserted through the other incisions. These tools will be used to repair the tendon or muscle. After either procedure, the incisions will be bandaged. Your arm will be placed in a sling or brace to immobilize the joint. Anesthesia prevents pain during the procedure. You may have some discomfort immediately after. Ask your doctor about medication to help with the pain. You may be able to go home the same day. Some may need to stay in the hospital overnight. Do not use the arm until instructed. Wear the sling or brace as directed. Follow instructions for physical therapy. Therapy is essential to regain shoulder strength and range of motion. Be sure to follow your doctor's instructions . The rotator cuff will take several months to heal. It may take some time before you can raise your arm above your shoulder. It may be up to 1 year before you can hold your arm above your head and do work with reasonable strength. An aggressive and consistent physical therapy and exercise program is the key to a faster recovery. Rotator cuff repair. Johns Hopkins Medicine website. Available at: http://www.hopkinsmedicine.org/healthlibrary/test%5Fprocedures/orthopaedic/rotator%5Fcuff%5Frepair%5F92,P07682/. Accessed February 8, 2018. 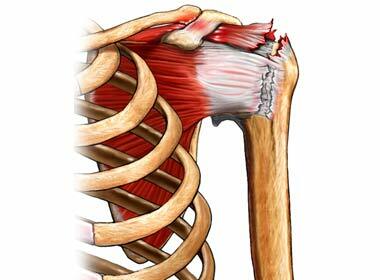 Rotator cuff tear. EBSCO DynaMed Plus website. Available at: http://www.dynamed.com/topics/dmp~AN~T114498/Rotator-cuff-tear . Updated February 16, 2017. Accessed February 8, 2018. Rotator cuff tears: surgical treatment options. American Academy of Orthopedic Surgeons website. Available at: http://orthoinfo.aaos.org/topic.cfm?topic=A00406. Updated March 2017. Accessed February 8, 2018. 6/2/2011 DynaMed Plus Systematic Literature Surveillance. http://www.dynamed.com/topics/dmp~AN~T114498/Rotator-cuff-tear : Mills E, Eyawo O, et al. Smoking cessation reduces postoperative complications: a systematic review and meta-analysis. Am J Med. 2011;124(2):144-154.e8.